Motivation and Organization… What does that look like to you? Right now, I’m figuring out what it looks like to me and how it can make me a happier, more productive person! I like this new trend of everyone picking a word that will “define”, so-to-speak, their year. Maybe it’s not a new trend, but I don’t generally do it. I picked one last year, but before that, I never really did it. I think I saw it as silly, but now I think I was just being cynical for whatever reason. What’s wrong with picking a word that will help define what you want to be or do or accomplish in the new year? Nothing! And I’m finding some joy out of picking a word. I originally was just going to go with motivation. I am more motivated now than I have been in a long time to do what needs to be done when it needs to be done. That first definition is interesting. Motivation is not just doing something, it’s doing something for a reason! I love that. Knowing why you are doing something is key in having the motivation to complete the task! Hmmmm… that’s boring and tells me nothing. So I look up organize. Yes! I am definitely motivated to have better planning and effort in all areas of my life! I have been exercising daily. I have been eating better. I am keeping track of my to do lists and appointments better by using my planner. I am tackling my laundry with more purpose. I getting back to menu planning, which I used to do religiously, but had stopped somewhere along the way. And, it’s not just those kinds of things. I’m also more motivated to being a better mom and wife. I am saying yes to my kids more often. Yes to reading books. Yes to playing games. Yes to their favorite meals. Because my time with those little people is short and I want to make the best of it! I just have to keep this going and keep an eye on knowing why I’m doing it! That is the key! We will all have different reasons for our motivation and we don’t have to share those things with others. Just figure out your reasons and what needs to be done and do it! 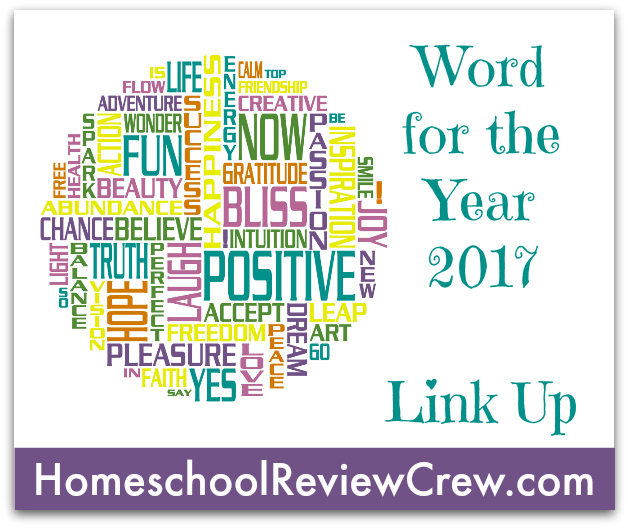 Did you choose a word (or two) for 2017? Would you like to share? I would love to hear about it in the comments below! Or link up with the Homeschool Review Crew if you wrote about it!